The volume opens a new frontier in parent-child communication research as it brings together veteran researchers and newcomers to explore the communication of parents and children as they create relationships outside the family. The chapters herein examine communication processes and problems of parents and children as they interact with childcare, healthcare, education, and youth sports; investigate the unique challenges facing various types of families as they communicate outside the family (e.g., stepfamilies and gay/lesbian/bisexual families); and consider the role of media in family relationships outside of home. 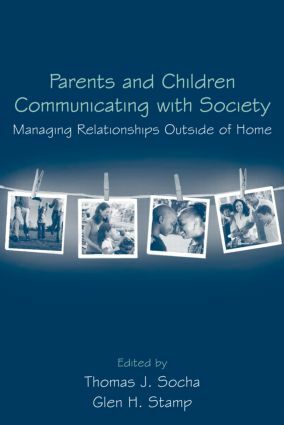 The primary audiences for the volume includes scholars, researchers and graduate students studying communication in families, children’s communication, communication in personal relationships, organizational communication, group communication, and health communication. It will also be of interest to psychologists who study families, children, and organizations; sociologists who study families, children, and organizations; education researchers; teachers; coaches; family physicians; and family therapists. graduate students It has the potential for use in courses in family communication, family studies, family sociology, and child development. Connecting Two Worlds of Childhood: How Do Parents, Childcare Providers, and Children Communicate?